I downloaded parts of the flightgear scenery. The folders were in .zip format. Flightgear, however, requires .tar.gz format. When I unpack the folders, the subfolders scatter over several other folders. How should I prepare for Flightgear to work with it? FlightGear does not require .tgz; it requires the scenery to be in subfolders. Therefore .zip is perfectly fine. From where did you download this scenery? FlightGear.org? 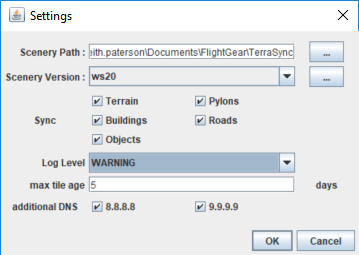 However, I recommend to use TerraMaster instead of downloading from flightgear.org - it is the same exact scenery but allows you to download only the area's you want as well as allowing you to update them without downloading all the .zips again. Yes, but TerraMaster don't work on my computer. Can you show me a link with that I can download the full flightgear map? The ftp server also don't work. Why does TerraMaster not work - what exactly happens / does not happen? Which Version? Then you might have the version with the excessive logging per default. Please use 2.0.1. That was my fault. Try setting the log level to Warning. Sorry can't help you there. terrasync.py isn't "mine". It is used to keep the mirrors in sync, so it should be sound. It is not a bug. Line 172 would indicate a Network issue.